It’s a truism that natives of any given place seldom appreciate what they have all about them: sunshine in LA is a given, as is the waterborne romance of Venice or the cultural kaleidoscope of London. 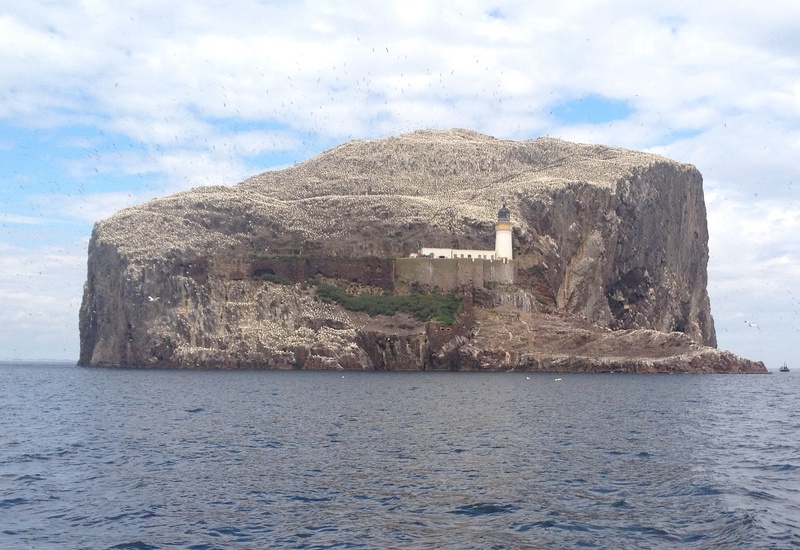 As a kid growing up in North Berwick, I thought little of Bass Rock, even though I went round or landed there many times. It was like Berwick Law or the wide Forth itself; just part of the scenery. Now, after two decades back home, my appreciation is growing sharper, even though I now regularly crew trip boats going out to visit it. It is a constant amazement to me—as well as visitors—that something this spectacular is not hidden away and inaccessible as other large gannetries like Shetland or St Kilda are: this one is 40 mins by train from Scotland’s capital, Edinburgh. Impressive as it is from shore, every time you approach it by sea, it reveals something new. The gannets wheel over it like a cloud, their patterns and directions always changing with the wind. The gugas grow by leaps and bounds, the fluff balls now almost as big as their 3kg parents and yet still another kilo to put on before they leave. The ‘mini-penguin’ guillemots have already left the East Cave but Kittiwakes still chorus their own name from the West Cave cliffs where yesterday no fewer than seven seals gamboled about the boat. This close up, the Bass itself is nothing short of spectacular, even after the gannets depart for Africa in October. 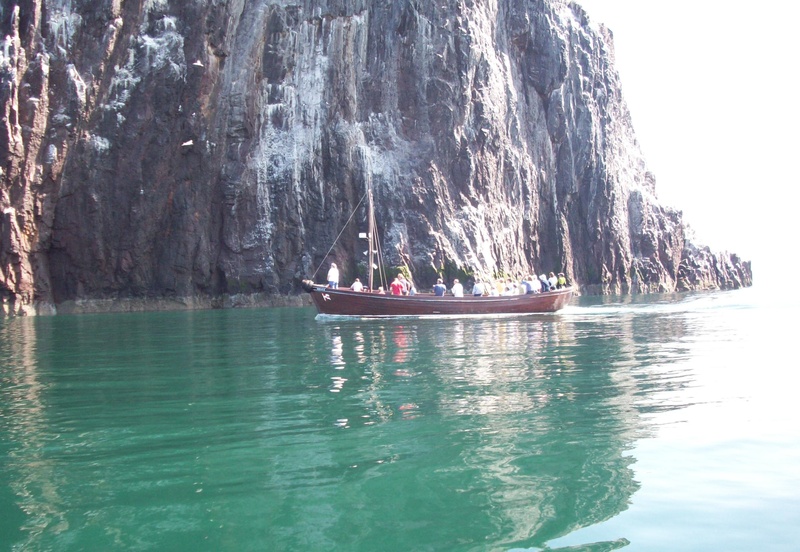 Sheer, unbroken 100m cliffs defend three sides and hint at the other 40m below the water. Scuba divers rate this among Britain’s best cliff dives. Boats can approach to within touching distance and, at one point, underneath the overhang. 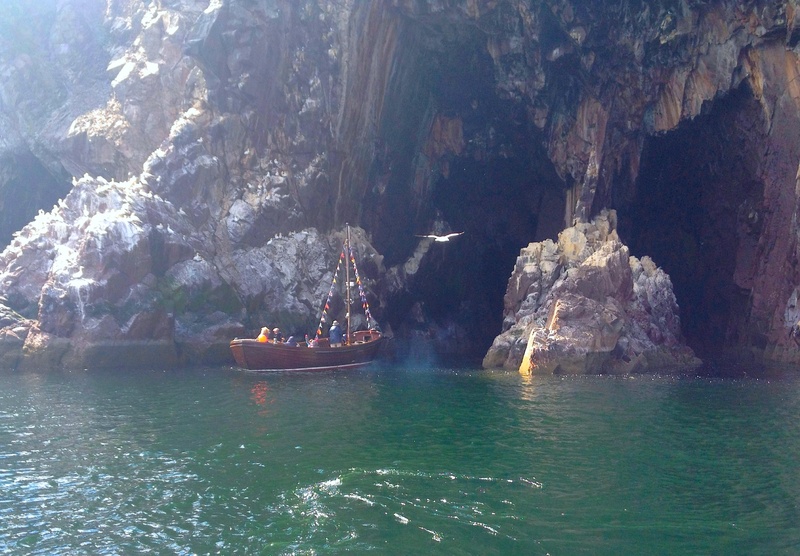 Although the Scottish Seabird Centre, established 12 years ago, also now runs trips out to the Bass, a traditional boat called Sula II had the run to itself for decades and the Marr family (Chris, Pat & father Fred) became famous for shipping people and researchers out there before before they passed it on last season. It still makes a stately adventure out of seeing this unique island close up. First recorded as a retreat for St Baldred, the 7th century monk who brought Christianity to the Welsh-speaking Goddodin on the back of Northumbria’s conquest of the area, it passed to the Bishops of St Andrews when Malcolm brought Lothian under the Scottish crown in the 11th century and then to the Lauder family who grew to such prominence that they were entrusted with being Keepers of both Berwick and Edinburgh castles. Their keep here was one they retired to in summer or when things got a little hot on the mainland. Since there is only one place low enough to land and the castle dominates it, this was regarded as among Scotland’s safest castles—more impregnable even than Tantallon, just a mile away on the shore opposite. In their time, a flock of sheep produced Bass mutton—much prized for its rich taste from the well fertilised grass—and fat solan geese, as the gannets were once known—although their taste (“between chicken and kippers”) was one that needed to be acquired. Although it never fell, the castle passed out of Lauder hands to pay for gambling debts being bought by James V, whose ancestors had always coveted it. In the 1680’s its dungeon was used as a cruel prison for Covenanter ministers, caught preaching in the fields in defiance of James II/VII. John Blackadder (buried in North Berwick kirkyard) was the most famous who died here. Finally used as a prison for Jacobite officers captured at Cromdale in 1690, they broke out, forced the garrison onto a supply boat they had been unloading and held out for three years before gaining passage to France. Sold for a pittance to the local laird in 1701, it was used for years as a hunting estate by gentlemen staying at nearby Canty Bay who would bag themselves a brace or two of solan geese, which were shipped as far as London. All this time, gannets had survived first the predations of the castle garrison, then such visitors and, finally, from lighthousekeepers, by nesting on inaccessible ledges on the cliffs, leaving the top clear for agriculture. Increasingly secure under a whole series of Wild Bird Protection Acts starting in 1890, gannets ran out of cliff ledges fifty years ago and have since colonised virtually the whole 1-mile-circumference rock, with the exception of the castle and landing areas, plus low-lying spots like the Midden which is liable to being swept by waves during storms. Their numbers are now passing 150,000 but such is their loyalty to the Bass that no-one knows what will happen when there is no nesting space left. In medieval Scotland, a synonym for the impossible was to “ding doon Tantaloon (knock down Tantallon castle) or build a brig tae the Bass (a bridge out to Bass Rock)”. The first was accomplished in 1650 when Monk’s artillery ruined the castle. But, though it still lies a daunting mile offshore, the increasing number of boats and visitors allows us to build a figurative bridge to this remarkable place so that all can enjoy its spectacle.